Not all innovations come from a research lab. Sometimes, you need to tackle a persistent problem using just what’s at hand and a big shot of ingenuity. We are proud to partner with the Water Environment Federation to recognize our awesome operators and their ingenious fixes. 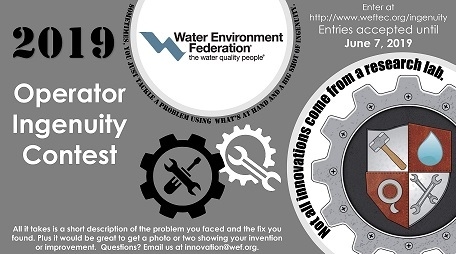 If you or someone you know has developed an ingenious fix to a problem at your facility, enter the @weforg Operator Ingenuity Contest www.weftec.org/ingenuity. We want to recognize you!